...not so much. Turned out ok.
Ok, I finally give up. I've tried.. ummm... let's see... at least 5 batches of Mozzarella now, and none of them turned out completely the way they should. I got just ok Mozzarella on a couple of batches. I was waiting until I found the right recipe combination to do a blog post, but I really can't afford to keep spending money on it. (I'm not one of those people who make money on their blogs. lol) It still tasted good, and I ended up with some nice spread for crackers a couple of times. 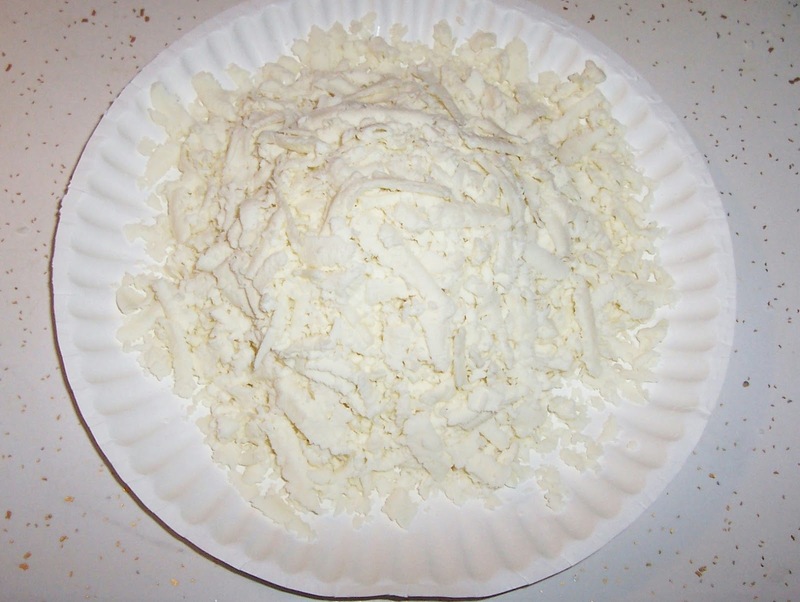 I ended up with some Mozzarella to shred and freeze, but the consistency seemed off a bit when I used it on a pizza. (Yes, cheese freezes well. I do it all the time.) I was never able to get that nice stretch at the end the way Mozzarella is supposed to. 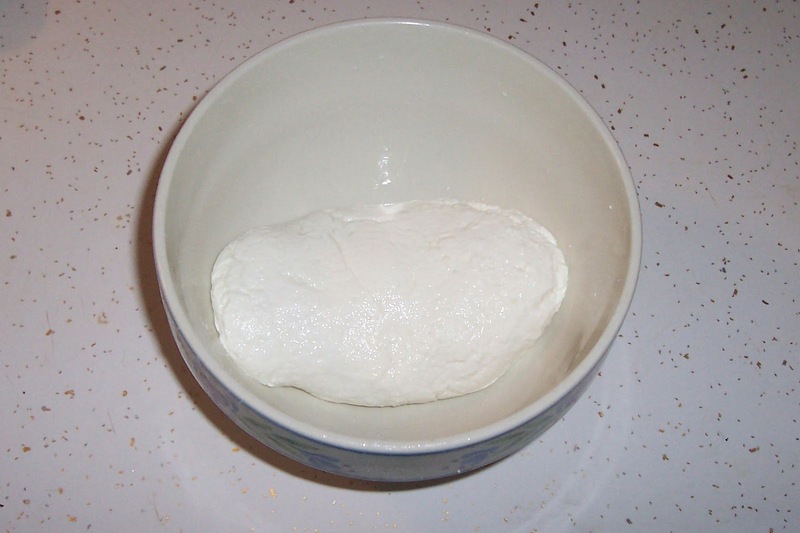 There are a lot of posts floating around on Pinterest and the internet about "easy 30-minute Mozzarella". Well, that's one of the recipes I tried. Actually, I found this article (click here) where she talks about these very problems and first-time cheese makers being disheartened by "easy" Mozzarella. She gives a recipe (click here) that she says works (it's in metrics, blah). I'd like to try it, but it calls for Thermophilic Culture; and I looked it up on E-bay and Amazon. Including shipping, on E-bay, it was $8.00 and Amazon $13.50 (for just 2 gallons worth of milk). If you have access to raw milk, I don't think you would need that; and if you don't, I don't think it would be worth spending too much money on making Mozzarella anyway. Better to just buy it on sale and freeze it. That's my thought on it anyway. One article recommended using calcium chloride when using store-bought milk (even though another article said this can take the "stretch" out of Mozzarella), so I tried that once; and the rest of the batches I did were without it. I tried rennet tablets, and I tried liquid rennet. I tried more sodium chloride and recipes with less. I tried letting it cure overnight and not letting it cure overnight, etc. If store-bought, you want to avoid the ultra-pasteurized milk. Just get regular whole milk. I've looked up many recipes, and they vary just a little in how much of the ingredients they use; but the ingredients are pretty much the same. Some vary in heating times or waiting times. 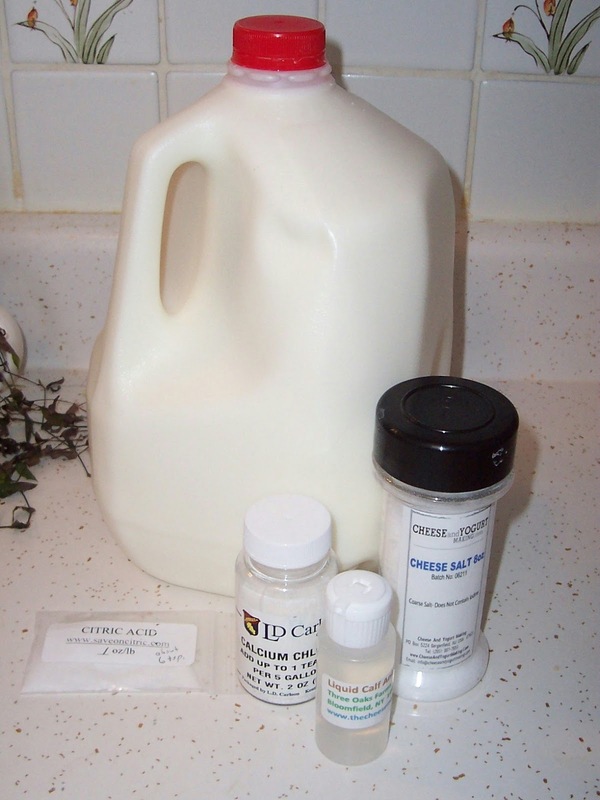 Again, I read that, when using store-bought milk, you should add calcium chloride to help it set properly. Yet another article said that calcium chloride will prevent Mozzarella from stretching properly, but I gave it a try since it wasn't working anyway. Of all the batches I've done, the best one was the one with calcium chloride; but like the other article said, it didn't stretch properly at the end. None of my batches did though. It was still yummy, and I grated most of it and froze it for later use. With the left-over whey, I made Ricotta and froze to use later. 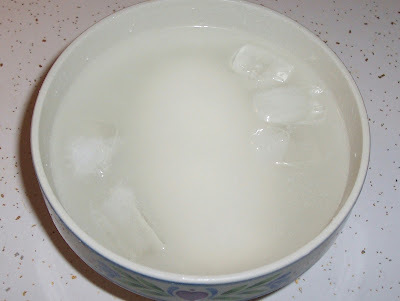 Dissolve the citric acid in a small amount of water and then stir in the milk. If you are adding calcium chloride, put it in now. 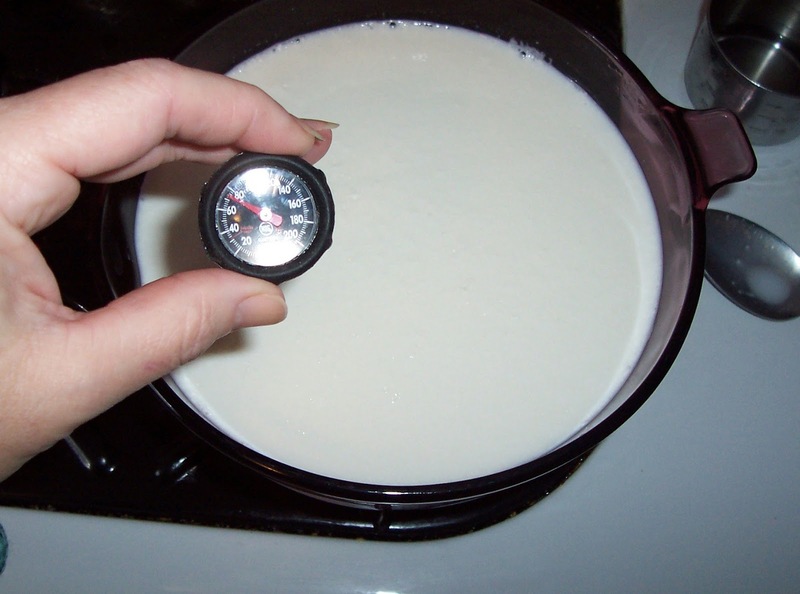 Heat the milk on low to medium heat , stirring often, until it reaches 90 degrees. Remove it from the heat and mix in the rennet (diluted in 1/4 cup of water) for 20-30 seconds and then just let it sit for 20-30 minutes or until the curds are set. Some articles recommend letting it sit overnight to cure. I tried both. I think this is where raw unpasturized milk comes together much better but not so much the store-bought. My house is very cold in winter, so I don't know if this plays a factor or not. Let it sit and drain for a while and gently squeeze more of the whey out. 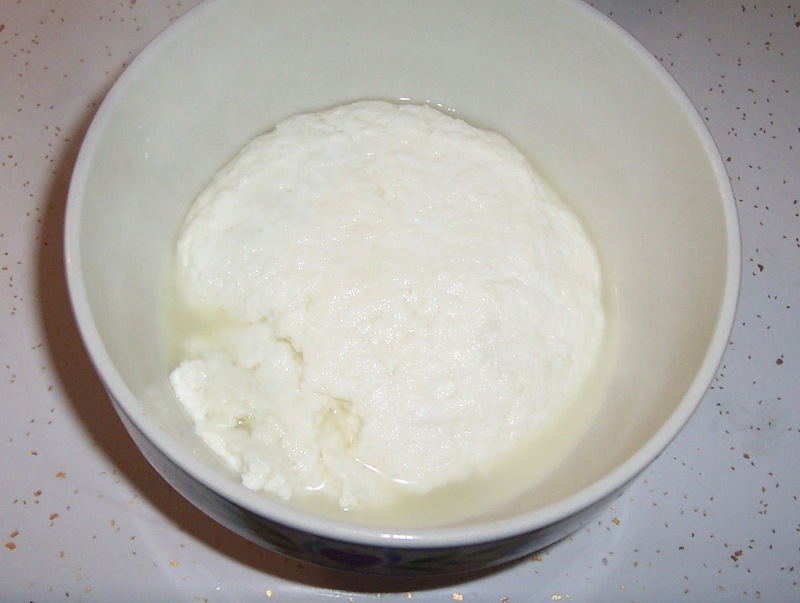 Put the curd in a microwave-safe bowl and heat for one minute on high and drain more whey out. You can use a wooden spoon to press it. Then, stretch the curd until it's smooth. You can microwave for another 30 seconds if necessary. Mix in the cheese salt. Shape into smooth balls or oblong shapes and put in an ice water bath to cool. Let the milk set out and warm to room temperature. Dissolve the citric acid in 1/4 cup water and stir it gently into the milk. (Add the calcium chloride here if using it.) Heat the milk slowly to 90 degrees. Remove it from the heat. Dilute the rennet in 1/4 cup water. Stir it into the milk for 20-30 seconds. 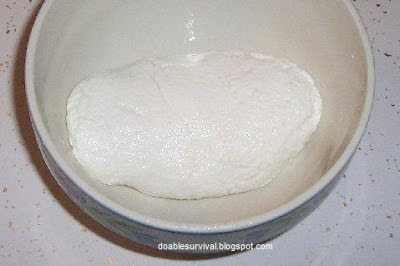 Cover and let it sit for 30 minutes or until the curd is set. 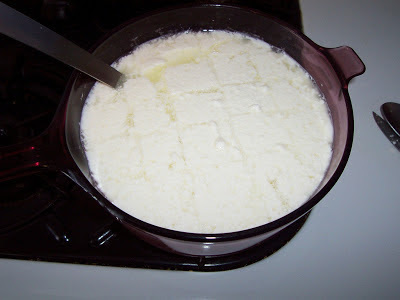 Cut the curd into 1-inch or so cubes and gently heat again, bringing the temperature up to 105 degrees. Remove from heat. 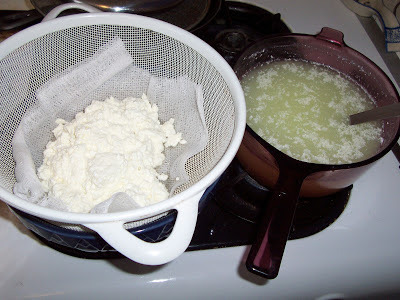 Use a slotted spoon to lift the curds into a strainer with cheesecloth. Press the curds gently to drain excess whey. 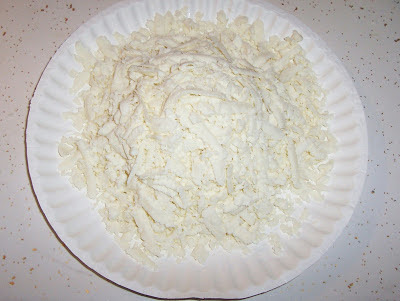 Put the curds in a microwave-safe bowl and heat for one minute. Remove and drain the excess whey. You can use a wooden spoon to press it also. Stretch the curds until smooth. If it needs more stretch, return it to the microwave for another 30 seconds and stretch it. Mix in the cheese salt. Shape into a smooth ball and put in an ice water bath to cool. 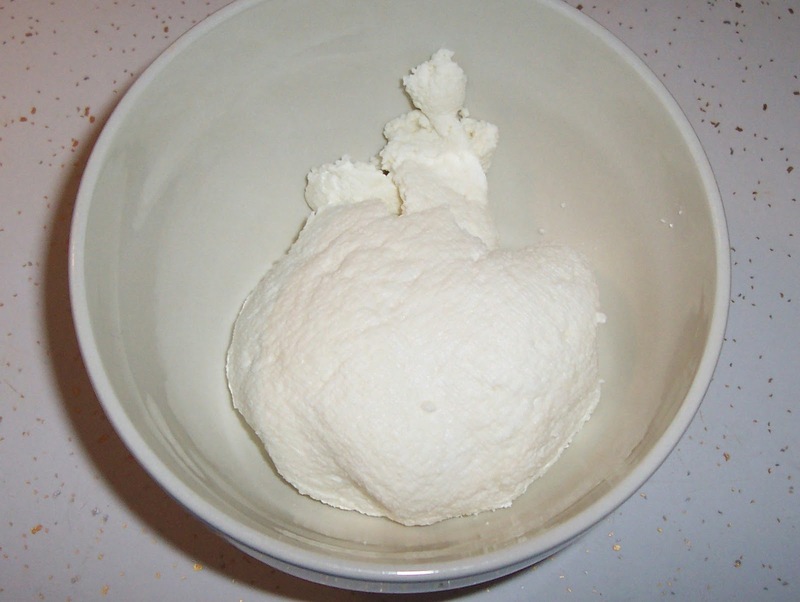 To make Ricotta with the leftover whey, leave it in the refrigerator overnight. The next day, heat it slowly to a temperature of 220, stirring often. Take off the heat and let sit until it cools to the touch. Strain through cheesecloth and let it sit to let more liquid drain off. That's it. It can be frozen. Liquid rennet - Animal rennet is best up to one year and vegetable rennet 4-6 months. Calf is said to be best for aged cheeses. I never knew ricotta was made from the mozzarella whey? I found out a store nearby sells a kit to make goat cheese.